To start the year off I was part of a Complicité open sound workshop with participants from all over the world taking part. We took a week to work with sound as a rehearsal tool, led by, Complicité associate, Catherine Alexander. 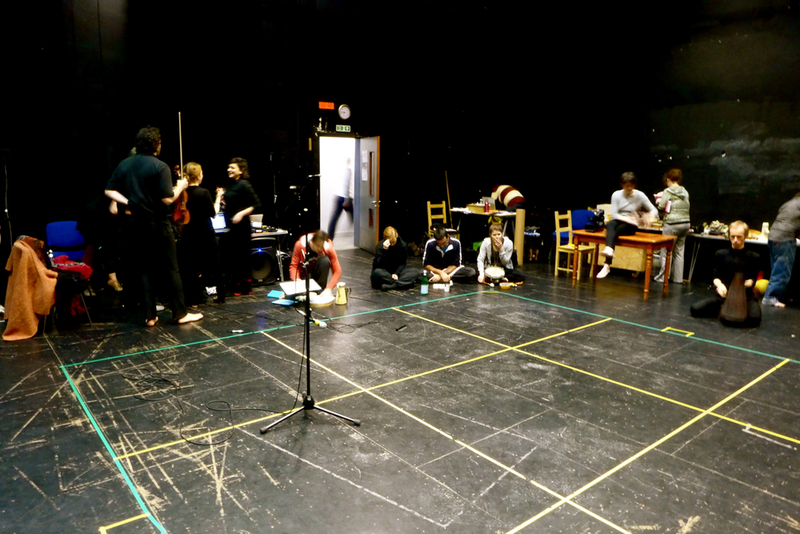 It was a really interesting chance to see how sound can effect the way a rehearsal process can evolve, how it can be used to analyse characters and scenes and map out sections of stories, to reveal new stories. Some really interesting sound experiments with both recorded and live sound/music. Inspector Sands, Rock Pool Working as Associate Sound Designer to Elena Pena, on a show for 3 - 5 year olds, the show was created by the company and Directed by Lucinka Eisler. The age range for the show created a bit of an extra challenge for us, but an interesting one! The show is set in a tiny rock pool, where a crab and prawn have been washed up and find themselves stuck! We used a mixture of Sound effects and Music (composed by Tom Mills) to create the audio world of the rock pool and the outside human world too, using props on stage to help make the music come from the stage and turn into playback music. At the start of the week Hamlet began its run at the Royal Shakespeare Theatre in Stratford Upon-Avon, Directed by David Farr the production will run until September 2013 in rep alongside As You Like it and Alls Well That Ends Well. It was great to work with the team at the RSC, some lovely people and just a nice a place to be. It was a learning experience I really enjoyed. The theatre itself is in a thrust configuration since its renovation a few years ago, which was an interesting space to work in.